Owing to an ancient Mayan prophecy, people have been trying to kill N.W. Twyford for many years before he was born. So far no one has succeeded. Nick (as he'd like you to call him) grew up in Crowthorne, a town famous for Broadmoor Hospital, home to many of the country’s most notorious disturbed souls. Having seen it only in passing at his secondary school’s sponsored walk, he cannot confirm whether it bears any resemblance to Arkham Asylum, but hopes it doesn’t. A lifelong fan of film and television programmes, Nick studied Film at Brunel University, and received a Masters in Screenwriting at Westminster University. He now works in the BBC’s Repeats Unit, which isn’t as repetitive as he thought it would be, and writes stories when he can, which is quite a lot of the time. 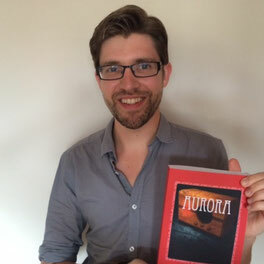 His novel, Aurora, is the first part of the All Worlds Unseen series. A sequel (Avalonne) and prequel (Never Do Well) continue the series, with the final book in the series, Eden, well underway.